FORT BLISS, Texas --On July 8, 1966, the chief of staff of the German Air Force inaugurated the German Air Force Air Defense School at Fort Bliss, Texas. 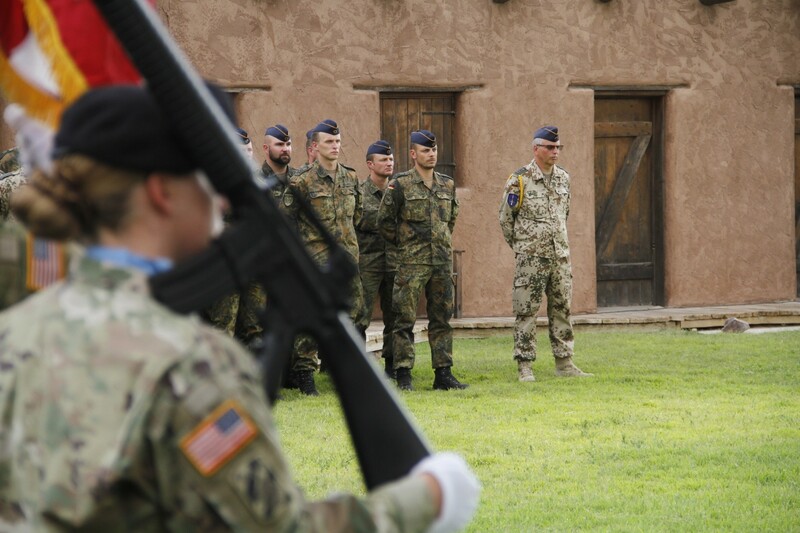 For a decade before that, German Air Force members trained at Fort Bliss and they continue to do so. In a ceremony at the Old Fort Bliss Replica July 9, Germans and Americans celebrated 60 years of training and 50 years of the center. 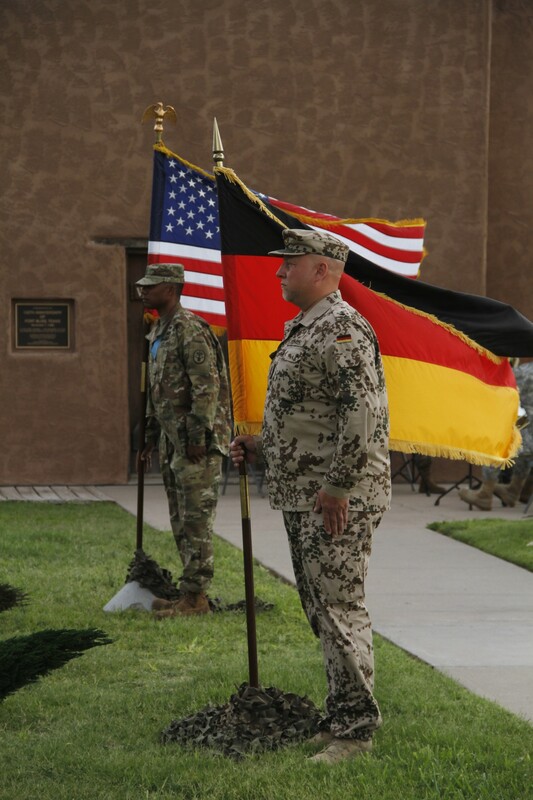 "The first two German air defense officers began their training here at Fort Bliss on Jan. 2, 1956," said Col. Ingo Kresser, commander, GAFADC and the German Air Force Liaison Element in Fort Sill, Oklahoma. "The GAFADS was established in 1964 in Aachen, Germany. It was deactivated and in 1966 moved to Fort Bliss." The years have brought many changes for the school, from the types of weapons systems used, to the number of personnel located here and at other U.S. military installations across the country. "Since the first students arrived in 1956 and the establishment of the GAFADS in 1966, more than 60,000 soldiers were trained for our air defense units in Germany," said Brig. Gen. Michael Gschossmann, commander, ground-based units, Air Force Forces Command, Cologne, Germany. In the 1980s, about 2,000 German students and permanent staff were here. Now, there are about 90 German airmen stationed here with their families and the school trains between 350 to 400 students on the Patriot weapon system per year. "For 60 consecutive years we train, we learn, we work, we live here side by side with our American friends and families," Gschossmann said. "I cannot think of any better example of international cooperation." First Armored Division and Fort Bliss leaders who attended the anniversary ceremony as guests included Maj. Gen. Pat White, commanding general, 1st Armored Division and Fort Bliss, Command Sgt. Maj. Danny Day, senior enlisted adviser, 1st Armored Division and Fort Bliss, Brig. Gen. Christopher Spillman, commander, 32nd Army Air and Missile Defense Command, and Col. Mike Hester, Fort Bliss Garrison commander. The Fort Bliss Sergeant Audie Murphy Club Color Guard presented the colors and the 1st Armored Division Brass Quintet supported on the musical front. German air defenders stood in the ceremonial formation. Throughout the years, the Germans stationed here have made El Paso, Texas their home. "Our soldiers with their families feel like home in El Paso, and also Fort Sill. We made friends with our neighbors and often have close ties with them," Kresser said. "We are welcomed and integrated and we actively take part in social and family activities." 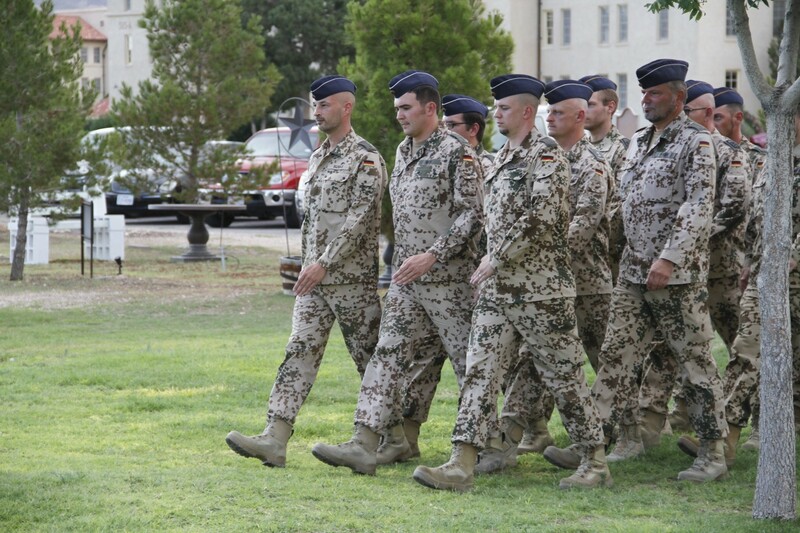 For some German air defense families, El Paso is their second hometown. "Many children of our families were also born in El Paso. Some of them became GFAD soldiers and have been stationed in Fort Bliss themselves," Gschossmann said. 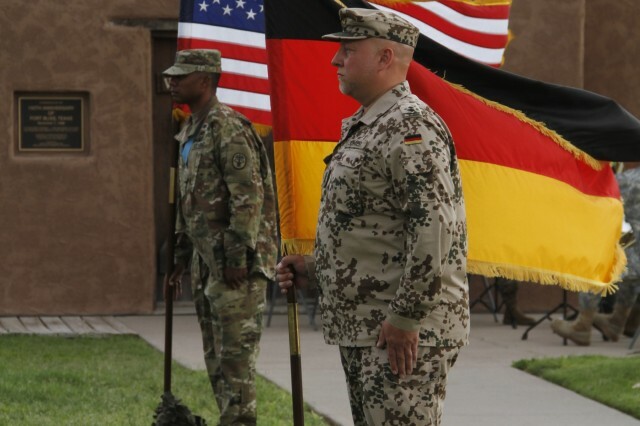 The ceremony recognized the long history of partnership between the two nations and the friendships that have been built here, and White echoed the statements of the German leaders. "It's all about making friends. It's about learning about each other's cultures, through the families and soldiers that have been here -- part of El Paso and part of Fort Bliss and we're glad to have them here," White said. Likewise, many U.S. 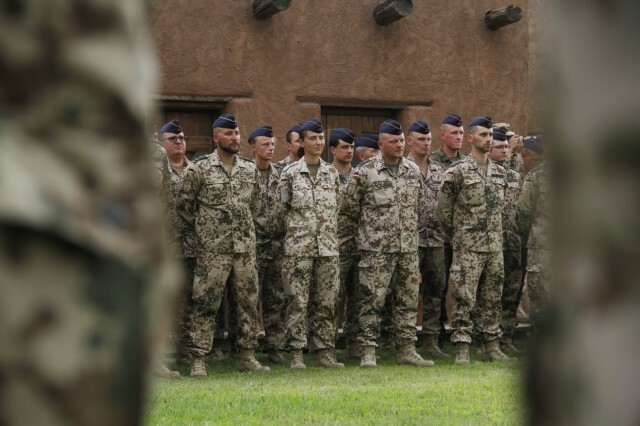 Soldiers have had the opportunity to be stationed in Germany, furthering cultural understanding and having similar experiences to what the German airmen and their families stationed here go through. "We spent 10 years in Germany and we were very welcomed. Two of our kids were born there, so we understand the reverse of it," said Emma White, spouse of Maj. Gen. Pat White, 1st AD and Fort Bliss commanding general. After the ceremony, the Germans hosted a reception for the attendees. 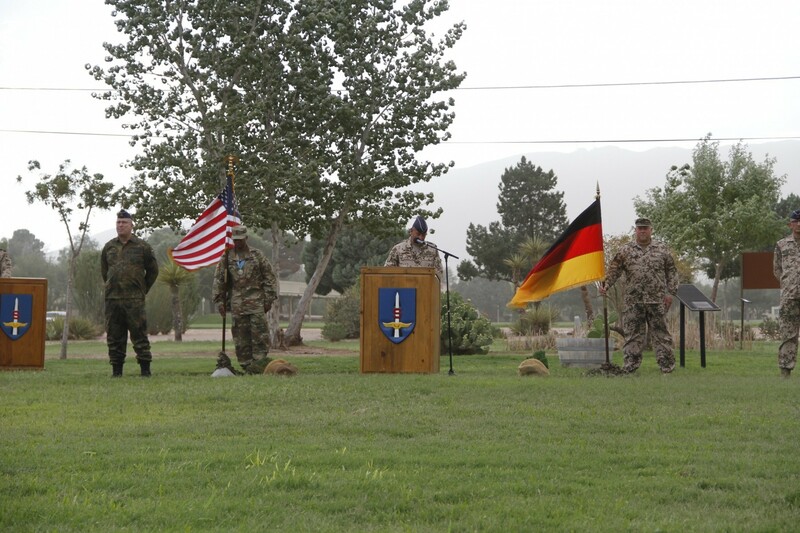 Changes are still to come for the German presence at Fort Bliss, but the strong partnership will endure.